The capacity to abuse, or in general affect the enjoyment of human, labour and environmental rights has risen with the increased social and economic power that multinational companies wield in the global economy. At the same time, it appears that it is difficult to regulate the activities of multinational companies in such a way that they conform to international human, labour and environmental rights standards. This has partially to do with the organization of companies into groups of separate legal persons, incorporated in different states, as well as with the complexity of the corporate supply chain. 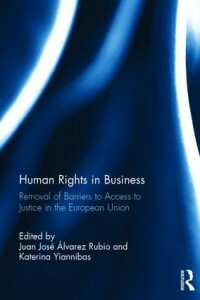 Absent a business and human rights treaty, a more coherent legal and policy approach is required. – To download from the book’s page on the Routledge website, choose “Other eBook Options” button for download options. – To download the free ebook from Amazon, click here. – To download the free ebook from iTunes, click here. I tried to download from Routledge website but I found no link for free download.